FACT: Not one single daily report for MSL weather issued by the REMS Team between August 22, 2012 and at least Sol 2165 on September 8, 2018 included any figure for relative humidity. As is seen on Figure 61 below all reports simply indicated --% or “Value not available” for relative humidity. Before Ashima Research got out of the business of MSL weather reporting it chose to reproduce none of the relative humidity data (really, lack thereof) on any of its reports taken from the REMS Team. Figure 61 above: Daily weather reports from REMS have not included relative humidity. Figure 62 above adapted from the REMS Team: On June 27, 2013 REMS published this chart, but up though at least September 8, 2018 it continues to leave relative humidity reported only as --% on all its daily MSL weather reports. On June 27, 2013 the information below appeared on the REMS Team website. Figure 62 was also on their site, although we cleaned up the fonts/text for clarification purposes. The relative humidity data offered do not match any of the daily weather reports by the REMS Team, which then continued to list all RH data as --%. OUR COMMENT: As we illustrate on Figure 63, when the relative humidity data and sol numbers on Figure 62 are matched with actual position, as published by the JPL, it can be seen that all variation in relative humidity, from about 60% down to less than 10% actually only occurs over a distance of about 400 meters. The description above was given by NASA/JPL-Caltech/CAB(CSIC-INTA on April 8, 2013. It must be noted again that as of at least May, 2017, no relative humidity figure has been incorporated into a REMS weather report. Relative humidity is the ratio of the partial pressure of water vapor in an air-water mixture to the saturated vapor pressure of water at a prescribed temperature. As such, the relative humidity of air depends on temperature and the pressure of the system of interest. If the assumptions about air pressure are wrong, as we believe is the case on Mars, then attempts to measure relative humidity will be worthless. This might be why relative humidity data is left off REMS weather reports. Figure 63: The REMS Team alleges large changes in relative humidity over small distances and with fairly constant temperatures. The relative humidity data shown on Figures 60 and 61 are not matched by daily REMS reports, as we noted in conjunction with Figure 61. Until July 3, 2013 we knew that over the first 11 months of operation the REMS Team and Ashima Research had put out clearly erroneous winds, sunrise and sunset times, pressure units, dates on their reports, months and claims about relative humidity that were not reflected on their reports. We (wrongly) assumed however that at least the temperature reports were reliable. That assumption was demolished on July 3, 2013 when they revised all temperatures back to the landing, wiping out scores of days where they had claimed air temperature highs above freezing. Some of these revisions are visible on Table 20 and Figure 64. Ground temperature problems will be discussed in conjunction with Figures 65 through 70. Figure 64: The REMS Team here appears to purposely sabotage all of its remaining credibility by going back and dropping very nearly all of its above freezing air temperatures to below freezing. The question which has not yet been answered by JPL (or by anyone else) � Who ordered these changes and why did they do so? Figure 65. 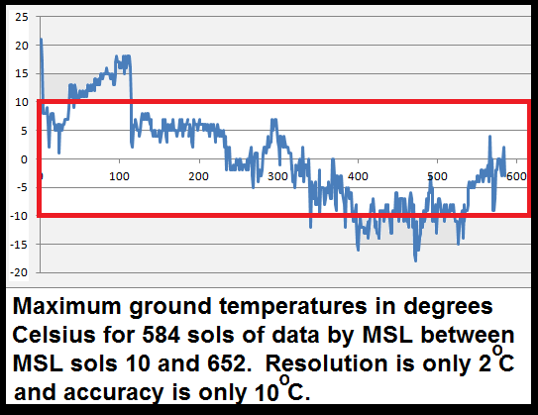 If the accuracy of MSL ground temperatures is only 10K, this creates a huge problem when it comes to understanding heat loss and air density. How accurate is the air temperature sensor designed to be? Air temperature was supposed to be recorded at both booms with a PT1000-type sensor placed on a small rod long enough to be outside the mast and boom thermal boundary layers. Its measurement range is 150 to 300 K. It has an accuracy of 5 K and a resolution of 0.1 K 28. The resolution of 0.1 K sounds fine, but 5 K is 9°F. The average revision in temperature shown on Table 16 is 13.08 K (23.54° F). That’s pretty lousy, but the situation is far worse for ground temperatures. THIS REPORT IS CONTINUED HERE WITH SECTION 15.1: GROUND TEMPERATURES AND POSSIBLE LIFE SEEN ON MARS BY MSL.